Work over the last 30 years has changed drastically. We now work our 8 or 10 hour job sitting at a compute preparing reports, connecting with our teams, etc. and so we spend our time sitting behind a desk for hours. If you have a similar job, then you are at risk to become part of the 82% of office community who suffers from chronic low back pain Roseville, CA, which is the second most common reason for office workers apply for leave in working days. If you are suffering the unbearable back pain for the last three months, then it is now a chronic problem and has the ability to impair the physical strength of your body. Or worse, it is the single leading cause of disability worldwide. When chronic low back pain strikes, there are many reasons behind this monster pain- it can be due to a herniated disc, facet joint dysfunction, spinal stenosis, sacroiliac joint dysfunction or many such severe reasons. There are many reasons for this chronic pain in the back, but the results of the condition are the same: inflammation to the spine and muscle disorder respectively. Inconvenient or poor sitting posture or sit all day in a chair with inadequate back support. Unfortunately, back pain, whether achy, sharp or stabbing can make it hard to concentrate on your job. There are many professions which heavily depend on the potential of your back like construction or factory work. Of course, factors like aging, obesity and poor physical condition also contribute to back pain. But in today’s highly advanced medical world, there is nothing which can’t be treated. Move a bit- We are human, not static machines, we are made to move. In fact, the experts also say that sitting or standing frequently in the same position for long hours may actually be causing or worsening your back pain and weaken back muscles. If back pain has you call in sick at work, then whenever you get certain free time, take a walk either with an excuse of drinking water or going to the washroom. Take breaks frequently, and never stay in one position for too long. Use headset instead of picking call directly- If you are a marketing specialist or doing some customer care executive job, your spend most of the time answering calls. To attend the calls you have to twist and bend your to take phone the ear area which again leads to neck pain. To avoid such pain, better to use a phone headset so that you don’t have to twist and turn your neck and head to talk and hold the phone. Set the position of your computer screen- Keep the screen about an arm’s length away or below the level of the eye. This will compel you to sit back, instead of leaning forward and cause strain to neck. Adjust the height of the chair- Don’t pull the height of your chair above the certain level so that you can’t keep your feet on the floor. Your chair should be like supporting the curve of your spine. For extra comfort, you can take the support of lumbar pillow in your chair in order to prevent back pain while working. Neglecting your back pain at work can plague your workdays and free time. 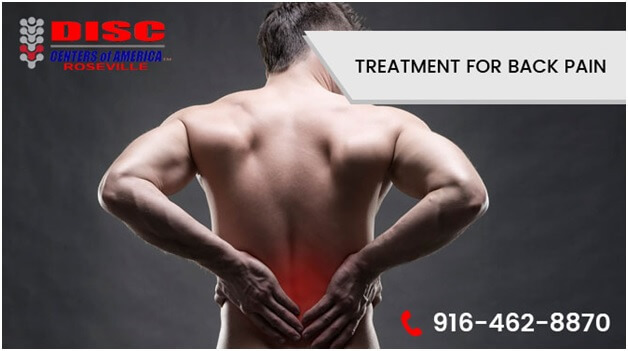 Treatment of your pain with the aforementioned back pain remedies Roseville, CA will be the ideal solution to keep its chronic pain apart from your professional as well as personal life.